It’s the winter..gets dark early, its cold, and sometimes dreary and snowy. It affects some of us in different ways – whether its mood swings, depression, etc. 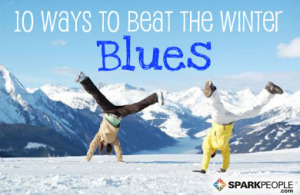 Here’s some great things to keep in mind as you plow through the winter blues! Winter is in full force. As the days get shorter and the nights get colder, even the best of us can get a little down. The “winter blues” are characterized by the mild depression, lack ofmotivation , and low energy that many people experience during this cold season . Luckily, there’s a lot you can do to both prevent the blues from coming on and get yourself back to normal if they’re already here. As if we needed another reason to get fit! Exercise isn’t only for maintaining your weight and staying healthy . It’s great for relieving the stresses of life. Plus, the effects of a good workout can last for several hours after you hit the showers. You’ll have more energy throughout the day, and your metabolism with stay elevated too. Exercise also helps your mind by releasing those “feel good chemicals” that improve your mood. What and when you eat has a great affect on your mood and energy. Avoid refined and processed foods (like white breads, rice, and sugar). These foods are not only devoid of the nutrients your body craves, but they zap your energy levels and can affect your mood—causing depression , lack of concentration, and mood swings. Try to incorporate more complex carbohydrates (whole wheat breads, brown rice, veggies, fruit) and get your daily 8 cups of water. These healthy foods provide your body (and mind) with nutrients, and stabilize your blood sugar and your energy levels. Most people know that sunlight provides us with Vitamin D . But did you know that it also improves your mood? Winter days are shorter and darker than other months, and because of the cold weather, a lot of people spend less and less time outdoors. Lack of sunlight can cause many people to become depressed—without knowing why! Similar to exercise, sunlight exposure releases neurotransmitters in the brain that affect mood. Try to spend a little more time outdoors. Keep your shades up during the day to let more light in. Sit near windows in restaurants and during class. Try changing the light bulbs in your house to “full spectrum” bulbs. These mimic natural light and actually have the same affects on your mind as the real thing. A recent study from the CDC showed a strong link between healthy behaviors and depression. Women who exhibited healthy behaviors (like exercising, not smoking, etc.) had less sad and depressed days than those whose behaviors were less than healthy. Although researchers studied women, the results are likely similar in men….. Follow this link to continue reading the article in its entirety.